To subscribe or unsubscribe, email info@PathologyOutlines.com, indicating subscribe or unsubscribe to Case of the Week.� We do not sell, share or use your email address for any other purpose.� We also have emails for Pathologist jobs (biweekly), Other Laboratory jobs (biweekly), website news (monthly), new books (monthly), and a newsletter (twice a year).� You must subscribe or unsubscribe separately to these email lists. This Case is sponsored by PSA.� Sign up for Maximize Your Pathology Billing Performance: 10 ways to optimize collections, an interactive Audio Conference on May 31, 2007 hosted by Robert Burleigh, CHBME and sponsored by PSA, LLC and Laboratory Economics. Participate in this call and you will receive the resources to assess the effectiveness of your billing software or service provider, identify key measures for optimizing revenue and evaluate the technology advancements that can reduce accounts receivable cycle time. �This is a convenient and cost-effective call, so don't miss this opportunity to gain valuable information on enhancing your practice's revenue. �To learn more or to register, visit us online at www.psapath.com. 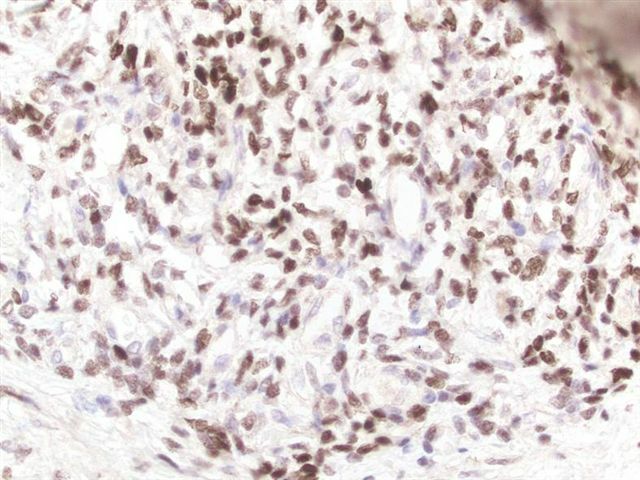 Visit our Stains chapter for our recently expanded coverage of cytokeratins CK1 to CK24, high/low molecular weight cytokeratins and broad spectrum cytokeratins, accompanied by hundreds of new references and image links.� We also have a new contest/drawing for subscribers to our Laboratory (non-pathologist) email list (email info@pathologyoutlines.com with the message �subscribe to laboratory jobs email�), and have added new books to our Books pages.� Sign up for our New Books email by emailing info@pathologyoutlines.com with the message �subscribe to new books email�. 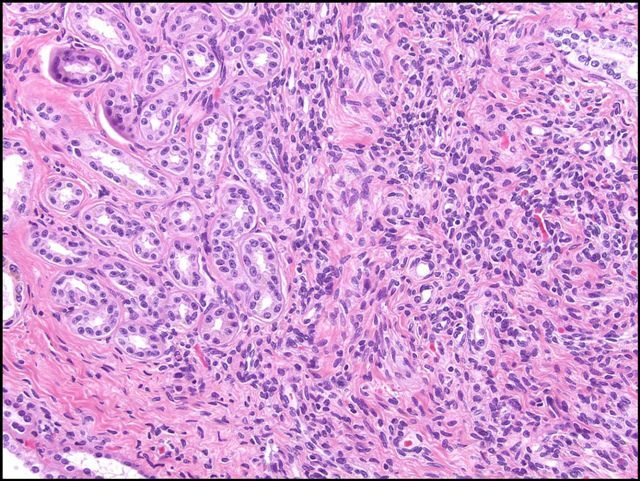 We thank Dr. Julia Braza, Beth Israel Deaconess Medical Center, Boston, Massachusetts (USA), for contributing this case.� We invite you to contribute a Case of the Week by emailing info@PathologyOutlines.com with microscopic images (any size, we will shrink if necessary) in JPG or TIFF format, a clinical history, your diagnosis and any other images (gross, immunostains, etc.) that may be helpful or interesting.� We will write the discussion (unless you want to), list you as the contributor, and send you a check for $35 (US� dollars) for your time after we send out the case.� Please only send cases with a definitive diagnosis. 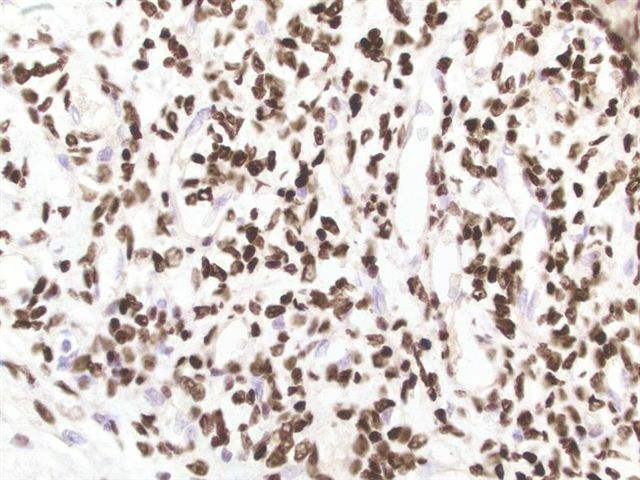 It usually occurs in the renal pelvis as a well circumscribed but unencapsulated yellow-tan tumor with solid and cystic components and a mean diameter of 6 cm.� Microscopically, there are benign epithelial tubules and cysts in ovarian-type stroma that contains smooth muscle, fibroblasts and myofibroblasts.� Cysts often have hobnail epithelium.� There is no blastema, no immature epithelial elements and no atypia.� Typically, there is no hemorrhage, necrosis or mitotic activity. 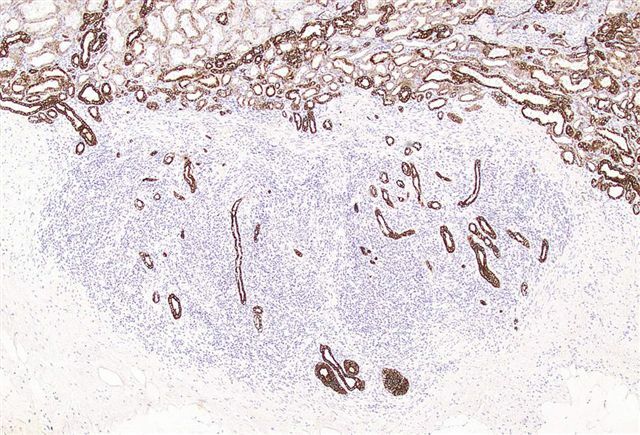 The epithelial component is immunoreactive for broad spectrum cytokeratins (AE1-AE3), EMA, CEA and vimentin.� The stroma is positive for smooth muscle actin, desmin and vimentin as well as estrogen and progesterone receptors. 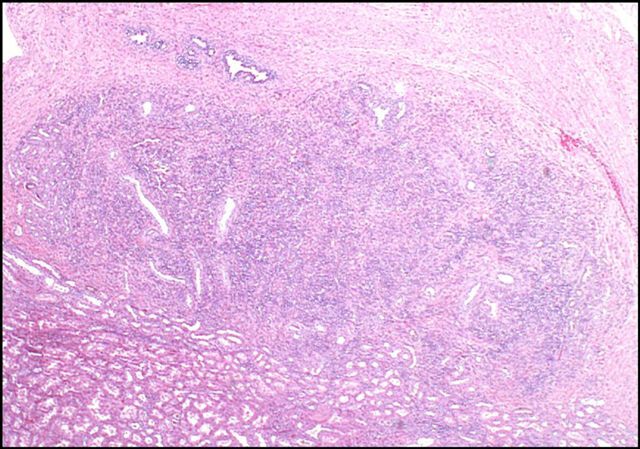 These tumors have benign behavior, with no recurrences of metastases. 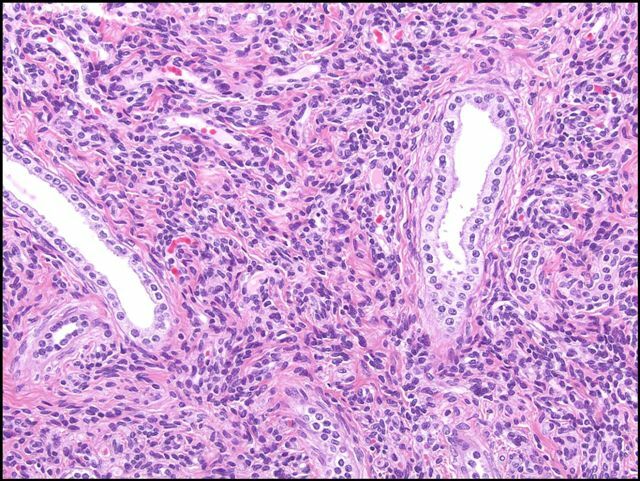 Recent reports suggest that mixed epithelial and stromal tumor may be related to cystic nephroma, due to similar demographics (middle-aged women), predominance of cysts lined by hobnail cells, ovarian-type stroma, lack of atypia and benign behavior (AJSP 2007;31:489, Ann Diagn Pathol 2006;10:77, Archives 2006;130:80).� However, mixed epithelial and stromal tumors do not occur in men, are more often immunoreactive for ER and PR, have higher stromal ratios and more frequent ovarian-type stroma, and often lack large cysts. The differential diagnosis may be broad, depending on the relative amounts of various components present.� It includes Wilm�s tumor (blastema present), metanephric fibroma (children and young adults, no cysts, stroma is negative for actin and desmin), clear cell carcinoma (has more than occasional clear cells), and sarcomatoid renal cell carcinoma (prominent atypia, necrosis and mitotic figures).